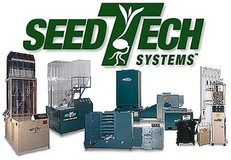 SeedTech Systems, LLC has been designing and manufacturing air density separators and dryers since 1993. Our product line has been assisting companies large and small all over the world with upgrading the quality of their seed lots. Our equipment is state-of-the-art and our product line includes machines for even the smallest applications. Our air separator systems are specifically designed with precision seed upgrading in mind. The three main uses for our air separators are close grading where seed is “graded” based on density or volume weight; stoning for the effective removal of heavy debris from batches; and precision upgrading which effectively separates partially filled and immature seeds from the rest of the seed lot. Our Dryer systems are designed and engineered for precision of temperature, humidity and air flow for drying all varieties of seed. The STS dryer systems trap air and humidity with precise calibrated temperature and discharge them at a given rate based on seed density and seed moisture content. The bottom line, STS manufactures a product line we stand behind and are proud of. In fact, our company CEO is personally involved in every order from inception to delivery. Though we are proud of our product line, it is our customer base and business relationships that we feel are our greatest accomplishments. In fact, 75% of our annual business is from repeat customers. This alone is our true measure of success and reaffirms that we are doing something right.